Summary / KeywordsIn 2010, one cool word was relaunched as the artists’ publication OCW Magazine with the help of Jaz Halloran, after Tracy Stefanucci registered the organization as the non-profit Society OCW Arts & Publishing Foundation. "OCW Magazine is an interdisciplinary art project dedicated to the cultivation of new ideas, new voices, and new ways of experiencing art. Each issue is an object of art, a forum for discourse and a vehicle for engagement with art, culture and ideas." OCW 6.1/#20: Material Arrangement is part of Goethe Satellite @ 221A, a project produced by 221A Artist Run Centre in cooperation with OCW Magazine, Mindpirates and Revised Projects. The publication serves as a print component of the project, expanding upon the exploration that was exhibited at 221A from November 18 to December 16, 2011. 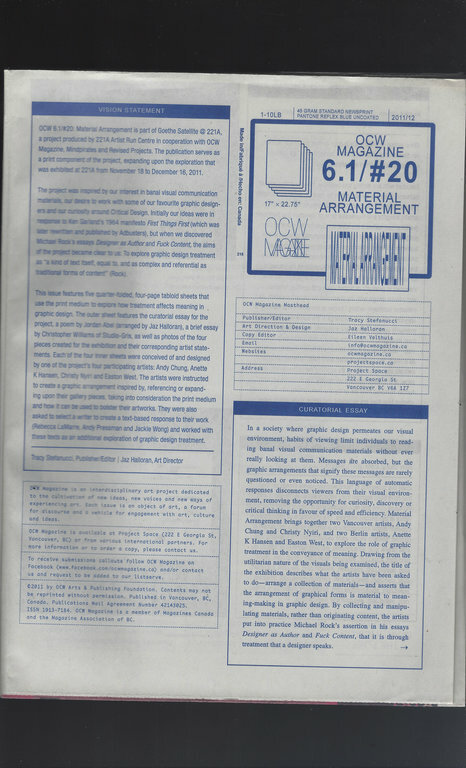 Notes'This issue was printed by International Web Express on 45 gram Standard Newsprint, in an edition of 1000 copies."